Are Jehovah's Witnesses the only ones that Preach? Watchtower claim Jehovah's Witnesses alone fulfil a divine command to preach about God's Kingdom from house-to-house. This is based on a mistranslation of Acts 20:20 in the New World Translation. Furthermore, all Christian religions preach in one form or another, otherwise they would not have any adherents. The preaching work was instituted by Jesus as an important aspect of Christianity and Jehovah's Witnesses can be admired for the tremendous effort they devote to preaching. However, is their belief that they alone fulfil Jesus' command justified? Only Jehovah's Witnesses preach from "house to house"
Jesus simply stated that the "good news" of the kingdom must be preached. Mark 13:10 "Also, in all the nations the good news has to be preached first"
Matthew 24:14 "And this good news of the kingdom will be preached in all the inhabited earth for a witness to all the nations; and then the end will come." Watchtower claims it is only Jehovah's Witnesses fulfil this command. Are Jehovah's Witnesses the only group that preach the good news? If that was the case, what accounts for the growth of other religions and Christianity becoming the largest religious group globally? Can the largely unknown message distributed by 8 million Witnesses really be thought of as having more relevance to Jesus prophecy than the spread of Christianity by Catholics that has resulted in over 1 billion members? I am constantly preached to by Christians. I have had Mormons, Seventh-day Adventists, Christadelphians and people from the local Catholic Church come to my house. There have been Christians at different companies I have worked that discuss their beliefs with me. When I was at university there were Christian Campus groups, and when I was a tax accountant several of my clients were involved in missionary work. Christians have approached me in the street, or assemble as groups to sing and give public lectures in the local mall. On television, radio stations and the Internet there is no shortage of religious discussion. It is incorrect to imply that only Jehovah's Witnesses preach. Following are just some notable examples of religions actively engaged in preaching. Paul shows that not every Christian would actively evangelise. Ephesians 4:11-12 "And he gave some as apostles, some as prophets, some as evangelizers, some as shepherds and teachers, with a view to the readjustment of the holy ones, for ministerial work, for the building up of the body of the Christ ..."
Christian groups that do not have a door to door ministry often contain well organized evangelical programs. For instance, a group renowned for their preaching efforts are Baptists. Baptists have the most missionaries of any religion. In 2004 there were 7 million Baptists out side of America, 600,000 baptisms and 21,000 new churches. In 2004 Witnesses baptised only 200,000 globally. Interesting information on the significant efforts of Baptist missionaries can be viewed at internationalministries.org and namb.net. "The JESUS Film Project distributes the film "JESUS," a two-hour docudrama about the life of Christ based on the Gospel of Luke. The film has been seen in every country of the world and translated into hundreds of languages since its initial release in 1979. Our goal is to reach every nation, tribe, people and tongue, helping them see and hear the story of Jesus in a language they can understand. So whether a person speaks Swahili, French, or a language whose name is extremely difficult for most to pronounce, he or she will encounter the life and message of Jesus in a language "of the heart." Through use by The JESUS Film Project, and more than 1,500 Christian agencies, this powerful film has had more than 6 billion viewings worldwide since 1979. On top of that, the great majority of those heard the story of Jesus in a language they easily understand. As a result, more than 201 million people have indicated decisions to accept Christ as their personal Savior and Lord." "The Gideons International, founded in 1899, serves as an extended missionary arm of the church. The association has more than 250,000 members, located in 181 countries of the world. They are united in carrying out the same program using the same methods to accomplish the one objective of winning others to Christ. The emergence of more than 2,000,000 readers in the world each week creates an unprecedented need for reading material. Annually, The Gideons International is placing and distributing more than 63,000,000 Scriptures worldwide. To God be the glory!" Pentecostalism is the world's fastest-growing Christian movement with over 150 million adherents, growing at an estimated 19 million members per year. All religions preach in some form. Otherwise they would not have any members. The reason that Christianity is the world's largest religion with billions of followers is centuries of preaching work by self sacrificing Christians globally. Many millions of missionaries devote their lives to the preaching work, and hundreds of millions informally discuss the good news. Great disservice is shown to these individuals when ever it is said that only Jehovah's Witnesses participate in the work Jesus described. An article entitled "'End Times' Religious Groups Want Apocalypse Soon"1 discusses the huge global preaching effort currently underway. It states that "40% of Americans believe that a sequence of events presaging the end times is already underway". The effectiveness of the Jehovah's Witnesses preaching work is noticeable from the absence of any mention of them in the article. The greatest preaching work of all have been by the Catholic Church, who boast over 1 billion members, and who virtually all other Christian groups owe their existence to. This work continues to our day and catholicmission.org (23 July 2006) quotes Pope John Paul II as saying "I sense that the moment has come to commit all of the Church's energies to a new evangelization and to the mission ad gentes (to the nations.)" The site outlines the joy of joining in with spreading the message of Christ. When the Watchtower claims they are the only group that preach, what is really meant is that Jehovah's Witnesses are the only people that preach the Watchtower interpretation of God's Kingdom, principally from "house to house". The Watchtower places great emphasis on the 'house to house' ministry, yet Mark 13:10 simply says "Also, in all the nations the good news has to be preached first." It does not dictate how this is to be done. Though the house to house work is an acceptable way to preach, it is never indicated scripturally as a sign of who God's followers would be. In fact, house to house is not even prescribed as the way to preach. A close look at the scriptures that the Watchtower uses to specify house to house preaching is enlightening. Mark 1:39 "And he did go, preaching in their synagogues throughout the whole of Gal´i·lee and expelling the demons." Acts 9:19-20 "He got to be for some days with the disciples in Damascus, 20 and immediately in the synagogues he began to preach Jesus, that this One is the Son of God." The only time that the term "house to house" is used in regards to preaching to unbelievers was when Jesus sent out the 70 disciples. On this occasion Jesus stated "Do not be transferring from house to house." Luke 10:1-7 "After these things the Lord designated seventy others and sent them forth by twos in advance of him into every city and place to which he himself was going to come. "Wherever YOU enter into a house say first, 'May this house have peace.' And if a friend of peace is there, YOUR peace will rest upon him. But if there is not, it will turn back to YOU. So stay in that house, eating and drinking the things they provide, for the worker is worthy of his wages. Do not be transferring from house to house. (Ek oikia eis oikia)""
The Watchtower quotes two other Scriptures from Acts to indicate a person should preach "house to house," yet neither of these scriptures leads to such a conclusion. The Greek used at Acts 5:42 and Acts 20:20 is not Ek oikia eis oikia, but rather Kata oikos. For this reason most Bible translations render this "in every house", "at home" or "in their homes". The New World Translation uses the phrase "house to house" at Acts 20:20, though the footnote acknowledges that the Greek word means "in private houses". "However, from Mi·le´tus he sent to Eph´e·sus and called for the older men of the congregation. When they got to him he said to them: "YOU well know how from the first day that I stepped into the [district of] Asia I was with you the whole time, slaving for the Lord with the greatest lowliness of mind and tears and trials that befell me by the plots of the Jews; while I did not hold back from telling YOU any of the things that were profitable nor from teaching YOU publicly and from house to house." A more accurate way to understand these scriptures in Acts is "we were teaching you at your homes" similar to the way Witnesses hold congregation book studies. Paul here relates his past activity in teaching "the older men of the congregation" privately within Christian homes. Early Christians did not have Churches but met in homes, and it is to this that Paul was referring. Romans 16:5 "and [greet] the congregation that is in their house." Colossians 4:15 "Give my greetings to the brothers at La·o·di·ce´a and to Nym´pha and to the congregation at her house." 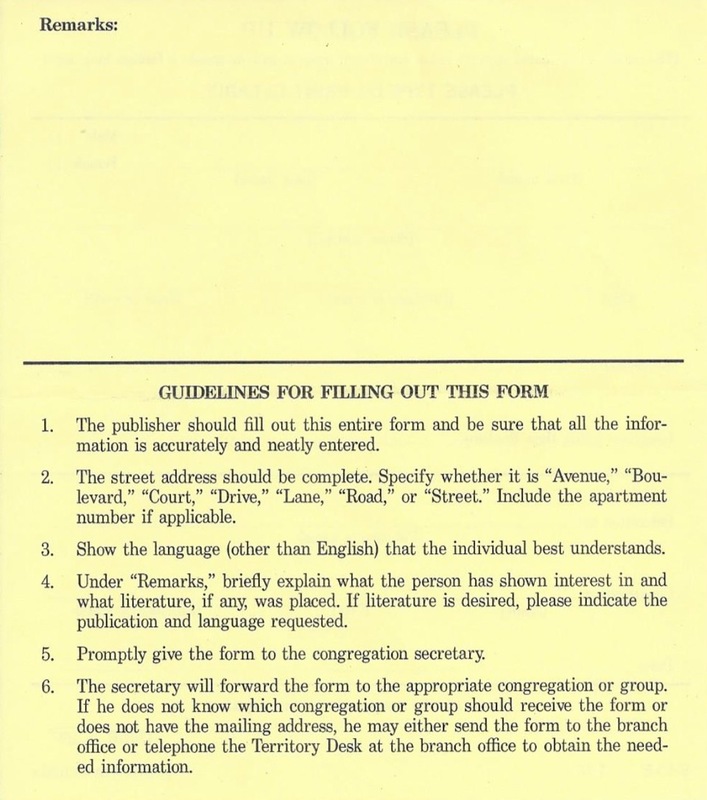 In 1972, Watchtower acknowledged that Acts 20:20 does not apply to door to door preaching. Hence, Organization for Kingdom-Preaching and Disciple-Making page 56 footnote used the following quote from Doctor Robertson, showing that kai kat' oikous was used to indicate preaching to existing Christians such as Aquila and Priscilla. "...and from house to house (kai kat' oikous). By (according to) houses. It is worth noting that this greatest of preachers preached from house to house and did not make his visits merely social calls. He was doing kingdom business all the while as in the house of Aquila and Priscilla (1 Cor. 16:19)." Only seven years later, in 1979, the Watchtower went back to using Acts 20:20 to indicate that Jehovah's Witnesses must preach door to door. "These twelve Jesus sent forth, giving them these orders: "Do not go off into the road of the nations, and do not enter into a Sa·mar'i·tan city; but, instead, go continually to the lost sheep of the house of Israel. As YOU go, preach, saying, 'The kingdom of the heavens has drawn near.' Cure sick people, raise up dead persons, make lepers clean, expel demons. YOU received free, give free. Do not procure gold or silver or copper for YOUR girdle purses, or a food pouch for the trip, or two undergarments, or sandals or a staff; for the worker deserves his food. "Into whatever city or village YOU enter, search out who in it is deserving, and stay there until YOU leave. 12 When YOU are entering into the house, greet the household;"
Though Matthew 10 is used by the Watchtower as a key reference in promoting the door to door ministry the text is disregarded by Witnesses in its entirety. The Watchtower message focuses largely on the earthly organization and earthly paradise rather than the heavenly aspect of the kingdom. Miracles such as raising the dead, faith healing and exorcism are not practiced. Rather than giving free, donations are requested to cover the cost of the literature and prior to the change of tax status the money raised for selling literature is what developed the Watchtower Society into a billion dollar business. Finally, the disciples did not go house to house, they searched out a single house to stay. A brother in my congregation once asked a rhetorical question during a public talk, "Who else follows Jesus command at Matthew 24:14"? A newly interested Bible study piped up, "Mormons." Everyone was somewhat shocked, as the question was not demanding an answer and the answer given was certainly not acceptable. The brother replied to the effect that Mormons may go house to house but they do not preach about the kingdom. What is the "good news of the Kingdom?" It is the message about Jesus and his heavenly kingdom. 1 Corinthians 15:1-3 "Now I make known to YOU, brothers, the good news which I declared to YOU, which YOU also received, in which YOU also stand, through which YOU are also being saved, with the speech with which I declared the good news to YOU, if YOU are holding it fast, unless, in fact, YOU became believers to no purpose. For I handed on to YOU, among the first things, that which I also received, that Christ died for our sins according to the Scriptures;"
Acts 1:8 " but YOU will receive power when the holy spirit arrives upon YOU, and YOU will be witnesses of me both in Jerusalem and in all Ju·de´a and Sa·mar´i·a and to the most distant part of the earth." Christians were to be Witnesses of Jesus, something that Jehovah's Witnesses are not renowned for. Galatians 1:7-8 " the good news about the Christ. However, even if we or an angel out of heaven were to declare to YOU as good news something beyond what we declared to YOU as good news, let him be accursed." Acts 28:31 "preaching the kingdom of God to them and teaching the things concerning the Lord Jesus Christ with the greatest freeness of speech, without hindrance." Jehovah's Witnesses spend far less time discussing Jesus and his heavenly kingdom than most Christian religions. Acts shows how intertwined the good news was with the message of the Christ. Powerful works were displayed, the Holy Spirit received, and baptism was in Jesus name, not to an organization - (see Baptism). Acts 8:4-17 "However, those who had been scattered went through the land declaring the good news of the word. Philip, for one, went down to the city of Sa·mar´i·a and began to preach the Christ to them But when they believed Philip, who was declaring the good news of the kingdom of God and of the name of Jesus Christ, they proceeded to be baptized, both men and women. Simon himself also became a believer, and, after being baptized, he was in constant attendance upon Philip; and he was amazed at beholding signs and great powerful works taking place. When the apostles in Jerusalem heard that Sa·mar´i·a had accepted the word of God, they dispatched Peter and John to them; and these went down and prayed for them to get holy spirit. For it had not yet fallen upon any one of them, but they had only been baptized in the name of the Lord Jesus. Then they went laying their hands upon them, and they began to receive holy spirit." "YOU are searching the Scriptures, because YOU think that by means of them YOU will have everlasting life; and these are the very ones that bear witness about me. 40 And yet YOU do not want to come to me that YOU may have life." The message the Jehovah's Witnesses carry to the doors is predominantly about Jehovah, the Organization and the coming earthly paradise, not Jesus and the heavenly kingdom. Can it really be said that the Watchtower message is 'Good News" when in reality it is about the coming destruction of 6 billion people at Armageddon? Is the "Good News" Known? Few people know what Jehovah's Witnesses believe. Ask a person what the Watchtower teaches and virtually no one will know the "Good News of the Kingdom" that Jehovah's Witnesses expect to live forever on earth. Witnesses are known predominantly for distributing books. In fact, the media has been more successful in education regarding Jehovah's Witnesses, since they are better known as letting children die refusing a blood transfusion, and for shielding pedophilies. That is in Western Countries. The fact is that most people in the world have never met a Jehovah's Witnesses and know nothing about them at all. It is an ignorant concept that Jehovah will choose to grant salvation based on how people respond to "the kingdom message," when billions have never met a Witness or know what the Watchtower message is. Preaching from 'house to house' is not an indicator of the true religion. The majority of preaching described in the Bible was done where people were, such as synagogues and in markets. If Witnesses were really interested in bringing people to Jehovah they would spend less time door knocking on empty doors or doing return visits five to a car mid week afternoons when most people are not at home. "… baptizing them in the name of the Father and of the Son and of the holy spirit,. 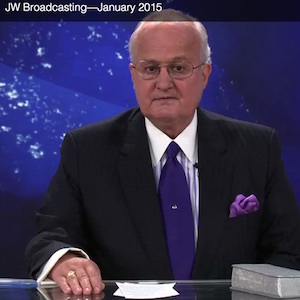 . ."
The preaching work conducted by Jehovah's Witnesses is becoming less and less effective. 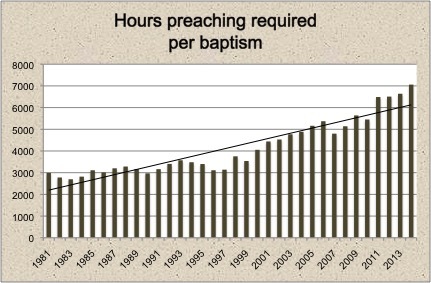 A simple evaluation of the yearly report shows that it takes 5000 hours of witnessing per baptism (1 billion witnessing hours in 2004 resulted in only 200,000 baptisms). If you take the figure of 200,000 and halve it for those born in the truth and then halve it again to account for those reached in informal witnessing an even more realistic figure would be 20,000 hours of door-to-door work for one convert. That is the equivalent of 166 people doing 10 hours each a month for a year. 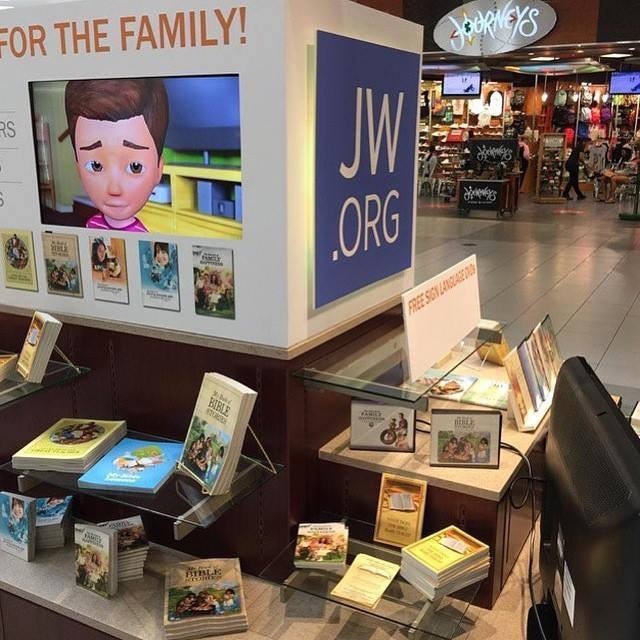 Watchtower is proud of the billions of books and magazines it has printed. Yet ask a random person what the Kingdom message of Jehovah's Witnesses is - or ask 100 - and it is unlikely any will know. The statistics sound impressive but the results are not. 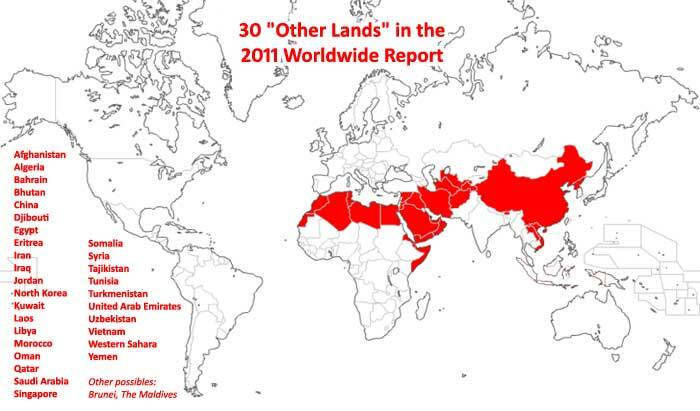 The 2011 Publisher report lists countries where Witnesses are banned under the category "30 Other Lands". Highlighted in red, these make up 16% of the earth's land surface, and account for 1.9 billion people, or 27% of the earth's population. Despite this, last year saw a peak of only 26,272 publishers across these countries combined, which is less than 1 in every 72,000 people. Other religious groups grow because members preach casually to friends at work, universities and anywhere else they may be found. They do not get hung up on where to preach and whether the hours can be put on a monthly report. Though Jehovah's Witnesses report a billion hours a year preaching, it is predominantly spent knocking on the doors of empty houses. If a person is interested in helping people and not just in reporting hours, there are far more effective ways to preach. When I pioneered in the Pacific Islands most houses I called on usually had someone at home. However this is not the situation in developed countries. In modern society the majority of houses are empty at the times Witnesses call, with both husband and wife working throughout the week and entertaining or playing sport on the weekend. I remember witnessing week in, week out and only meeting one or two people in a whole morning. Five of us would cram into a car for return visits during week day afternoons and be lucky if each pioneer found even one person at home. Jesus spent most of his time preaching in the streets, the synagogues and the markets, anywhere that people were and rarely if ever went house to house. Did the apostle Paul enter a town and go door to door? Never is that recorded. Rather he always headed straight to where the most people would be. If Jesus were alive today do you think he would have spread his urgent message by trudging door to door when he knew no one was going to be there? 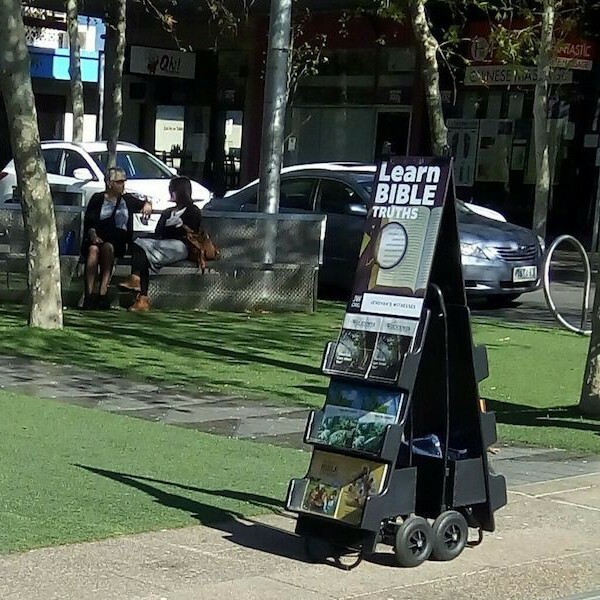 The introduction of cart witnessing in public places seemed to be a step in the right direction, not the carts filled with Watchtower literature, but the concept of preaching in the streets. The execution has been otherwise. 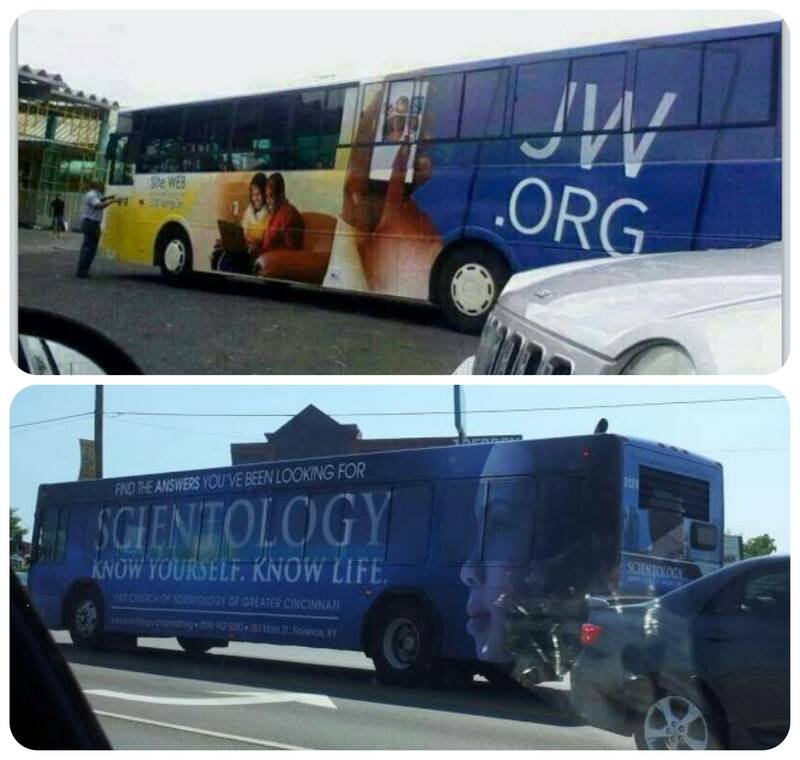 Jehovah's Witnesses stand idly by the carts, or hidden from view, rarely engaging with people. The rapidly diminishing conversion rates attest to the pointlessness of this passive endeavour. 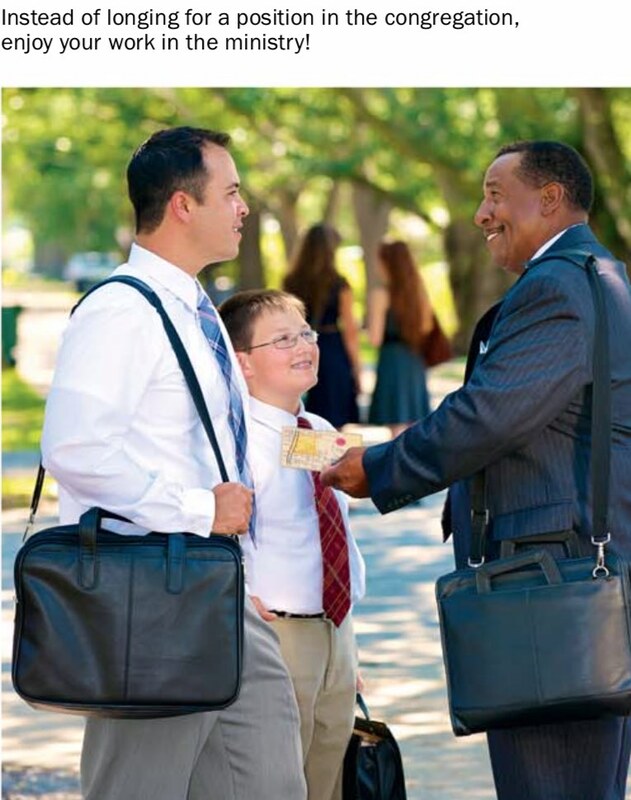 "While public witnessing should never overshadow the house-to-house work, it has proved to be an increasingly effective means to reach many with the good news of the Kingdom." 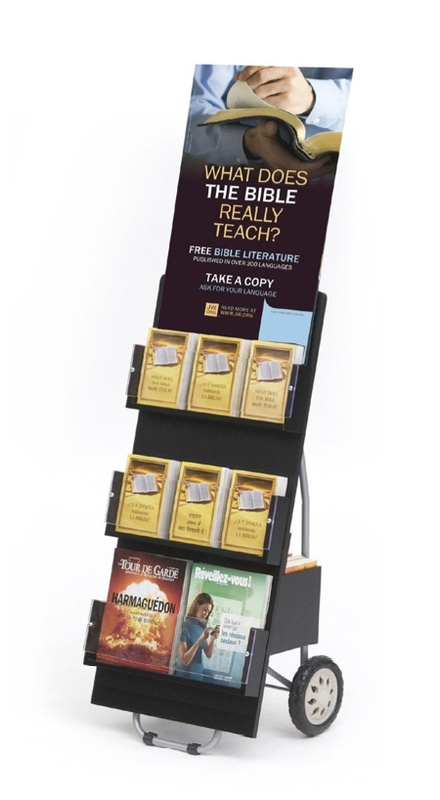 Though public witnessing more closely mimics the manner in which Christians preached in the Bible, the idea of setting up stands to distribute literature is not as done by early Christians and shows the Watchtower still presents itself predominantly as a publishing company. 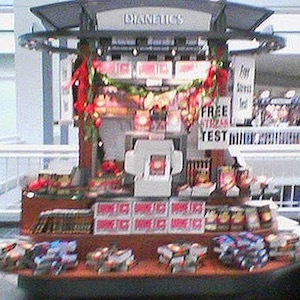 Public Witnessing is eerily similar to other coercive groups, such as Scientologists and Mormons, who were using displays in malls, buses and tv prior to Jehovah's Witnesses. 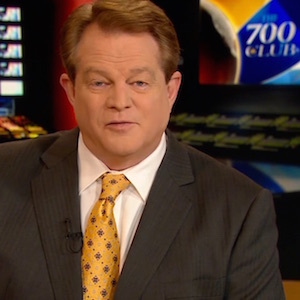 Likewise, the Watchtower online TV station, tv.jw.org, launched in November 2014 is copy of what Mormons have been doing with TV for years, such as The 700 Club. The Watchtower goes well beyond the Bible in the legislative procedure surrounding the witnessing work. There are a series of requirements and paperwork a Witness is required to comply with. Jesus and Christian Bible writers provided no outline regarding such micro-management. Following is an outline of some of the procedure required by the Watchtower. 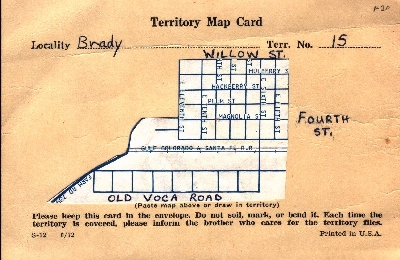 A house-to-house record card is used to keep track of houses where no one answers, a "not home", so that they can be revisited until someone answers. The form can also be used for recorded interested people, so as to keep track of "return visits". The level of detail, such as whether a child was home alone, or dates when people are not home, may shock many "householders" and considered an invasion of privacy. Witnesses systematically work each block in the territory that their congregation covers. This is managed by use of territory maps. On the back of the map is a list of people that have requested Jehovah's Witnesses do not call. The following from Watchtower 2013 Jan 15 page 21 shows an elder holding a territory map, along with a scanned example. 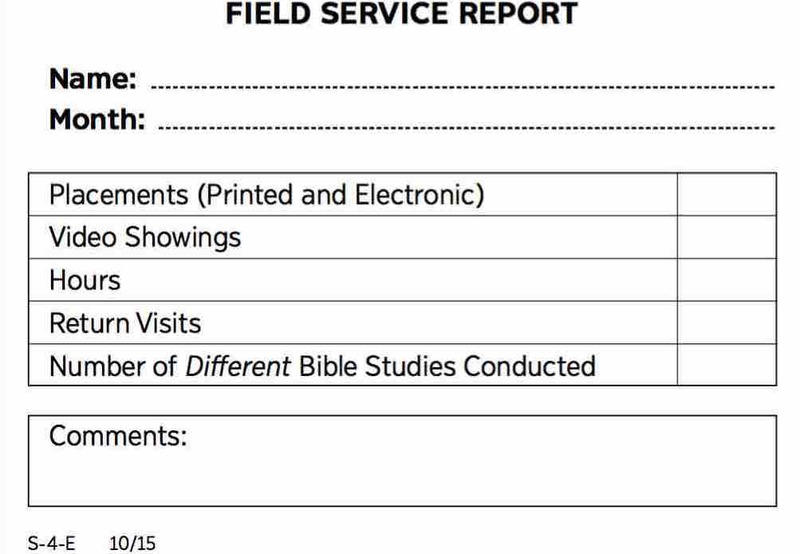 Each month, a Witness must submit a Field Service Report card, showing how many hours they have preached, and information such as placements made. A publisher that misses a month is termed irregular, and missing 6 months in a row deems a person inactive. To be officially regarded a Jehovah's Witness, you must be considered an active publisher. To qualify as a Ministerial Servant or Elder, it is generally expected that the person report at least the congregation average, around ten hours preaching per month. 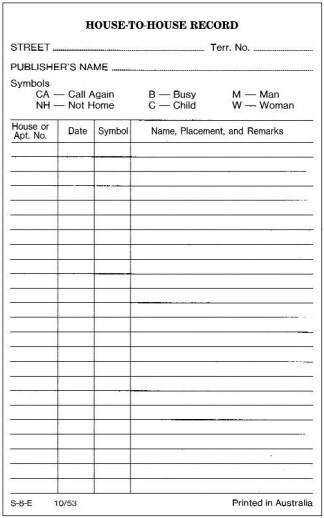 For many decades, up until the mid 2000's, each person studying with one of Jehovah's Witnesses was recorded on a "study report" slip, which was handed to the congregational elders on a monthly basis. There are several levels that a publisher can aspire to, such as an auxiliary pioneer, regular pioneer, special pioneer or missionary. These carry ever increasing requirements for minimum hours of preaching per month or year. Classed as privileges, a publisher must fill in an application form, confirm their moral worthiness, and confess their belief that "spiritual food from Jehovah is being provided through the "faithful and discreet slave" class and that this "slave" class is using the Watchtower Bible and Tract Society as its legal agency". 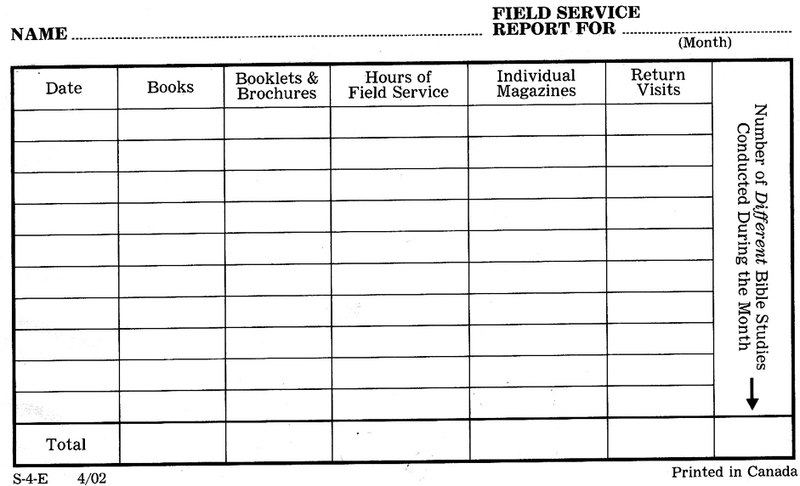 In 2012, an application form became required for Jehovah's witnesses wanting to become involved in preaching with Watchtower carts. This includes a series of questions to be answered by the applicant about any wrongdoing they may have been involved in, and a section for the elders to rate the applicant. 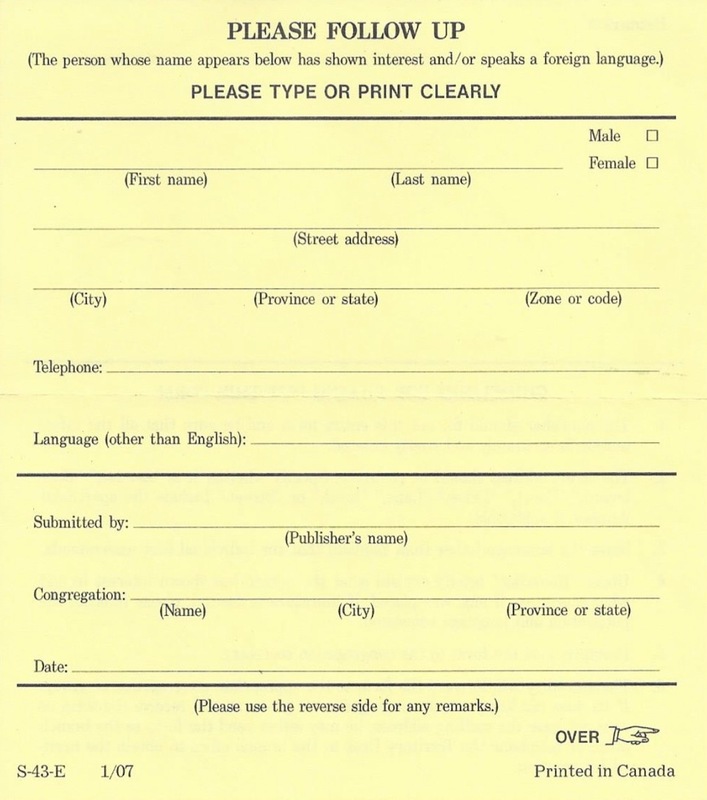 For many decades, Jehovah's Witnesses have used the Please Follow Up form when meeting people that speak a foreign language or are deaf. These detailed records of foreign speaking residents in each city were so that they could be reached by Jehovah's Witnesses that speak their language. The Watchtower claims their preaching method is the most effective, because it was instigated by Jesus. The Bible shows the most effective preaching in the first century was at the temple, at the city gates, in the markets, and wherever large groups gathered. It was not systematic transferring from house-to-house as done by Witnesses. Even if a house-to-house method had been effective 2,000 years ago, when villages were small and extended families lived in a single house, it does not make it effective today. In 30 A.D. there were no printing presses, cars, radio, television, aeroplanes, computers or the internet. The Watchtower has not been successful in utilising the most effective methods in modern times, as born out by over 5,000 hours of preaching required for a single convert. It is also incorrect to say that Jehovah's Witnesses have preached to the entire inhabited earth. Based on 2005 figures, around half the world, 3 billion people, have never seen a Watchtower. Between China, India, Pakistan and Indonesia there are almost 3,000,000,000 inhabitants and less than 50,000 Jehovah's Witnesses. 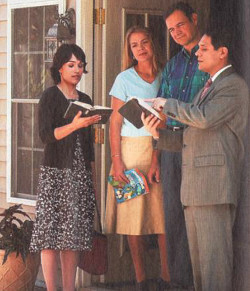 Everyday on average over 200,000 people are born, but the number of active Jehovah's Witnesses increases by only 224. This means that each day Armageddon is delayed there is an extra 200,000 people that Jehovah will be required to destroy who have never heard of him. If the end is contingent on Jehovah's Witnesses preaching to "all the inhabited earth", then that time is far off. Ponder on the statistics from the 2005 service year. A few thousand witnesses out of over 1.3 billion people in China. Has the Watchtower Society come close to completing their preaching work? Put simply, the Watchtower witnessing work amounts to be sales representatives for an organisation. The message is not, "Come to Christ", or even "Come to Jehovah", but "Become a member of our organisation." In the Watchtower message, there is no prospect of a relationship with God or for salvation without joining that specific group. If growing an organisation is the aim of preaching, then all religions must have been engaged in a preaching work of some kind, as they all have a body of members. The message of Jesus and the good news of his heavenly Kingdom has been, and continues to be, preached throughout the world by Christianity. Jesus did not limit how this was to be done. The method of house-to-house was not prescribed by Jesus, nor is it the most effective way to preach. Distribution of brochures and submitting monthly reports is never indicated in Scripture as a requirement to be considered in good standing before God. Once this is understood, it is clear that many religions fulfil Christ's command to preach, and the Watchtower goes beyond the Scriptures in the plethora of regulation around the preaching work. Originally published June 2005, latest update October 2018.